CompAndSave.com will donate $1 to the National Breast Cancer Foundation for every new like we receive on Facebook this month. This is a chance to not only bring about awareness to breast cancer but it will also bring us 1 step closer to finding a cure. 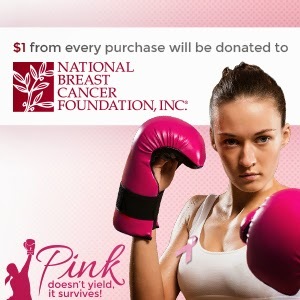 So go to our Facebook page and simply click on the like button and $1 will be donated to NBCF. CompAndSave.com will also donate $1 to NBCF for every re-tweet of #pinksurvives we receive on Twitter. Our goal this October is to not only join the fight against breast and help find a cure, but we also want to support and empower those who are currently fighting this battle. Just navigate to your Twitter page, leave us an uplifting message with the hash tag #pinksurvives and we will donate $1 to NBCF. Our “Pin it Pink” board is another simple and great way to get involved and show some support. Just go to our Pinterest page after joining our board and pin a pink picture, or you can simply re-pin any of those pictures to help us create awareness for breast cancer. The picture you pin can be anything uplifting and supportive to breast cancer awareness. Only rule is that it has to be pink. You can be as creative as you want with this one. Go to CompAndSave.com’s Youtube channel to view our celebrity video in support of Breast Cancer Awareness. We’ve partnered with famed film and television actress Kathy Bates to create a video that is meant to show everyone affected by breast cancer they’re not alone. We are in this together and together we will win the fight against this disease. So please feel free to subscribe to our YouTube channel and share the video with friends and family to support our cause further. 1 in 8 women, at one point in their life, will be diagnosed with breast cancer. We want to make sure that our current and new customers are aware of this and are taking the precise measures to keep themselves breast cancer free while supporting those dealing with this illness. For more information about our campaign please visit our support page and subscribe to our mailing list for great discounts on ink & toner! Recognized as one of the leading breast cancer organizations in the world, the National Breast Cancer Foundation’s (NBCF) mission is to help women now by providing help and inspiring hope to those affected by breast cancer through early detection, education and support services. A recipient of Charity Navigator’s highest 4-star rating for ten years, NBCF provides women Help for Today…Hope for Tomorrow® through its National Mammography Program, Beyond The Shock®, Early Detection Plan, MyNBCF online support community, and breast cancer research programs. For more information, please visit nbcf.org. Statistics show that one in eight women will be diagnosed with breast cancer at some point in their lifetime; which is the most common type cancer diagnosed in women. This disease is the second leading cause of cancer death in US women. Since this is an issue that affects all of us, this October we are working with the National Breast Cancer Foundation® to help make a difference in the fight against breast cancer. According to experts, early detection is still the best and most effective defense against this disease. When breast cancer is found early, in the localized stage, the 5 year survival rate is 98%. The best ways to be proactive are self breast exams, clinical exams with your doctors, your clinical breast exams and mammograms based on your age and health history. The best way to fight breast cancer is to have a plan that helps you detect the disease in its early stages. Create your Early Detection Plan at www.earlydetectionplan.org to receive reminders to do breast self-exams, and schedule your clinical breast exams and mammograms based on your age and health history. This October, we are donating $1 from every purchase to the National Breast Cancer Foundation to provide help and inspire hope to those affected by breast cancer through early detection, education, and support services. So with each ink and toner order that you place with us, know that you helped us support NBCF. You can do your part to contribute towards increasing awareness and ultimately saving lives. To know more about our initiatives, stay tuned by subscribing to our newsletter and liking us on Facebook. 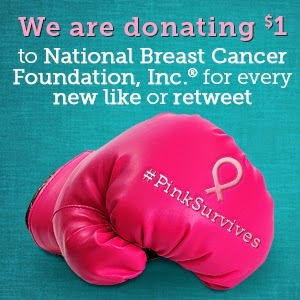 We are also donating $1 for every new Facebook like and every re-tweet of #PinkSURVIVES we receive on Twitter. Find out more about CompAndSave.com’s Breast Cancer Awareness campaign on our support page and see what else you can do to help us make a difference. CompAndSave.com, a Bay Area based company that provides compatible and re-manufactured ink & toner cartridges, will donate $1 from every transaction to the National Breast Cancer Foundation, Inc (R) , during the entire month of October. As part of their Breast Cancer Awareness campaign, CompAndSave.com is said to be taking their corporate social responsibility to the next level by dedicating the entire month of October to educate the public on the importance of early detection while supporting those who've been affected by breast cancer. "This campaign maybe one of the most, if not the most, important campaign we've ever run," said Andrew Yeung, President of CompAndSave.com. "This is critical and we wanted to take a different approach. We want to empower the people affected by breast cancer, in some shape or form. That's why our campaign slogan is Pink Doesn't Yield, It Survives!" In the effort to provide support and empowerment, CompAndSave.com will not only donate money to NBCF through transactions made on their website, they will also donate $1 for every new "Like" they receive on the company's Facebook Page and for every re-tweet of "Supporting the National Breast Cancer Foundation (R) @compandsave - Pink doesn't yield, #pinksurvives" on Twitter. Furthermore, with every purchase made worth $50 or more, customers will receive a free custom designed t-shirt with the campaign slogan "Pink Doesn't Yield, It Survives"; and they'll also receive a free custom designed "#PinkSurvives" wristband regardless of the total amount of their purchase. "We know that October is Breast Cancer Awareness Month, but we don't want to stop there," said Andrew Yeung. "We needed a way to continue bringing awareness and support for those who are affected by breast cancer. That's the purpose of the free t-shirts and wristbands." Their ultimate goal is to donate at least $10,000 to NBCF by the end of October and they're using a variety of different online presence to achieve that goal. For more information about CompAndSave.com and what you can do to support their cause, visit the campaign page and like their Facebook page. Recognized as one of the leading breast cancer organizations in the world, the National Breast Cancer Foundation's (R) (NBCF) mission is to help women now by providing help and inspiring hope to those affected by breast cancer through early detection, education and support services. A recipient of Charity Navigator's highest 4-star rating for ten years, NBCF provides women Help for Today... Hope for Tomorrow through its National Mammography Program, Beyond The Shock , Early Detection Plan, MyNBCF online support community, and breast cancer research programs. 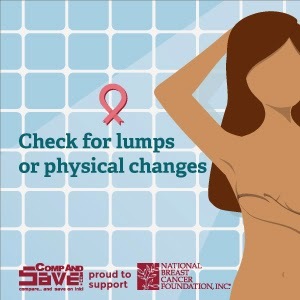 For more information, please visit nbcf.org.